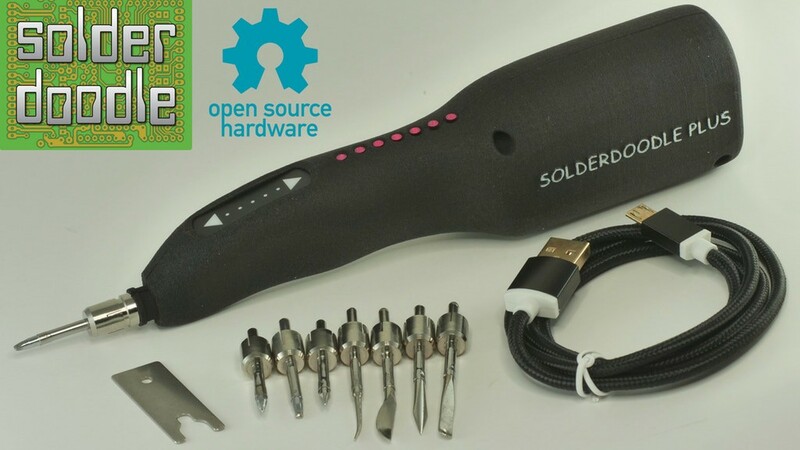 Mechanical engineer Isaac Porras (from Solarcycle) has relaunched the Solardoodle Plus — a cordless hot multi-tool that can be used as a soldering iron, 3D print finishing tool, and wood burner, all in the same package. The Plus offers double the power (10-watts) over the original and features an assortment of attachments that can be utilized for any number of projects. The Solderdoodle is outfitted with a high-efficiency, high-power charge controller and uses similar lithium-ion rechargeable batteries found in Tesla electric vehicles. With that said, the hot multi-tool has an hour of work time at maximum power (5000 C) before needing a recharge; however Isaac states that regular soldering sessions only last a few minutes long, so under regular use, the battery can last weeks on a single charge. Considering that the Solderdoodle is portable and charges over USB, you can tap into just about any mobile device power source if need be — portable rechargers, laptops, or even solar chargers if they happen to be available. As far as features go, the Solderdoodle is outfitted with a touch sensor that allows you to ‘swipe’ to different power levels, which is denoted on an LED power-level indicator. A switch on the back of the tool enables you to turn the tool on or off, and includes a safety mechanism that puts it in sleep mode when not in use. It is also compatible with a myriad of different tips — chisel, conical, wood burning, needle, spade, and blade, among others. Porras is currently crowdfunding the Solderdoodle on Kickstarter with pledges starting at $99 for the tool and tip package; but, you can get just the tip package for $41 if you prefer your own soldering iron or wood burning tool. Solderdoodle Plus Is the Swiss Army Knife for Soldering, Wood Burning and More was originally published in Hackster Blog on Medium, where people are continuing the conversation by highlighting and responding to this story.